Flo Rosenberg is a New Jersey Artist. She paints primarily in watercolor. Her subject matter varies. She enjoys painting the world around her, whether it is still life, flora or landscape. Her watercolors can be described as realistic and traditional. She combines both transparent and opaque techniques for contrast, mood, and emphasis, in a style that is truly her own. Flo Rosenberg is a graduate of NYU and Columbia University, where she earned her B.A. and M.S. in Art. She also studied at the Art Students League for many years, and is a Life member. 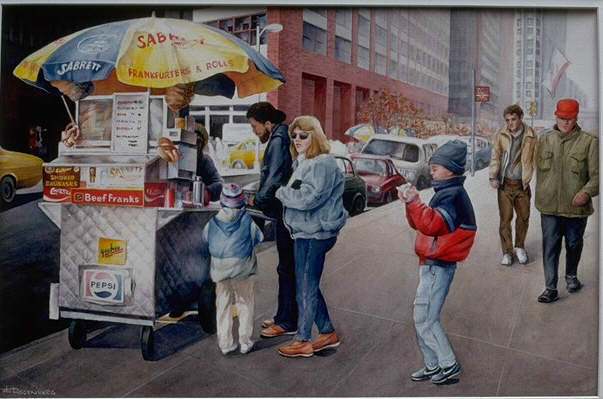 She is a member of the American Artist Professional League, the National Association of Woman Artists, and the New Jersey Watercolor Society. Her works have been nationally exhibited. She has shown in the New Jersey and New York area winning many awards. Click the thumbnail for larger image. Copyright (c) 2008 Florence Rosenberg. All rights reserved. Contact mfbda at aol.com.